*Photography by Alex Hsiao and Nancy Linden. 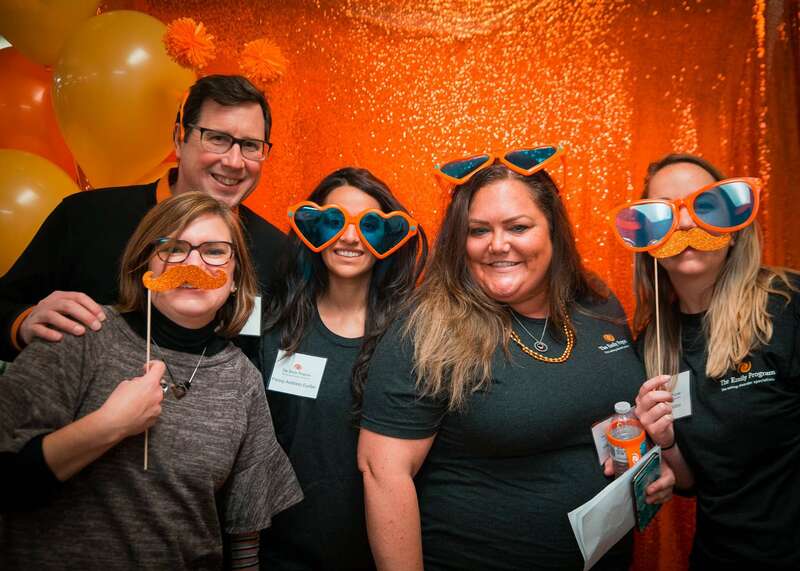 Over the weekend, The Emily Program hosted a community event to celebrate its 25th anniversary of providing eating disorder treatment and recovery. 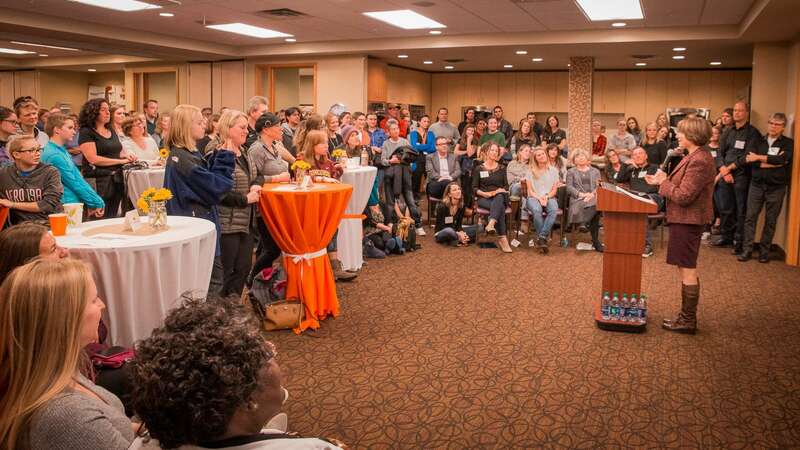 The celebration took place at our Saint Louis Park location in Minnesota and hundreds of community members, staff, and former clients came out to celebrate with special guests Jessie Diggins, Amy Klobuchar, and Kitty Westin. The event offered many interactive stations to help attendees understand what The Emily Program does in treatment to help people recover from disordered eating. 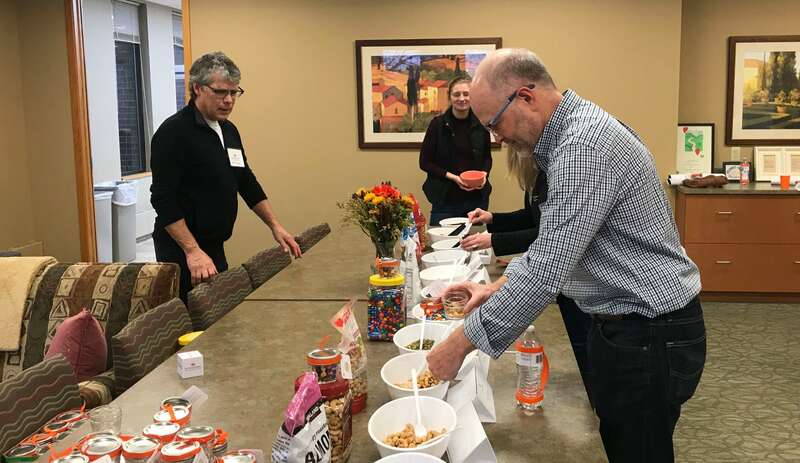 Activities such as “All Foods Fit” showcased a variety of foods (nuts, seeds, chocolate chips, craisins, yogurt-covered raisins) that participants were able to use to create their own trail mix. The message of the station was that all types of food have a place in a healthy diet. Other interactive stations included art therapy, a “tell-your-story” video booth, and a whiteboard labeled, “Don’t call me pretty, call me…” where participants changed the appearance-based word “pretty” to other empowering descriptors such as brave, thoughtful, creative, and kind. In addition to interactive learning stations, the event offered professional photographs with Olympic gold medalist Jessie Diggins, signed posters, a selfie station, cake, and other fun activities. Staff and volunteers were placed around the event to answer questions, chat with community members, and offer support as needed. While our interactive stations and fun activities were a hit, the most inspiring moments came from our featured speakers. Our program kicked off with our Chief Strategy Officer, Dr. Jillian Lampert, introducing The Emily Program founder, Dr. Dirk Miller. Dirk recounted the early days of The Emily Program, where he had only one staff member and they used milk crates for tables. From there, Dirk grew The Emily Program into what it is today—a specialized eating disorder treatment center focused on providing recovery for all types of eating disorders and co-occurring conditions. Prominent eating disorder activist Kitty Westin spoke about the dangers of anorexia, a severe illness that eventually took her daughter Anna’s life. The realization that Anna’s life might have been spared with access to appropriate treatment drove Kitty to transform her loss into positive action. With drive, determination, and support, Kitty helped bring the 21st Century Cures Act to Washington, where it was passed and signed into law by President Obama. 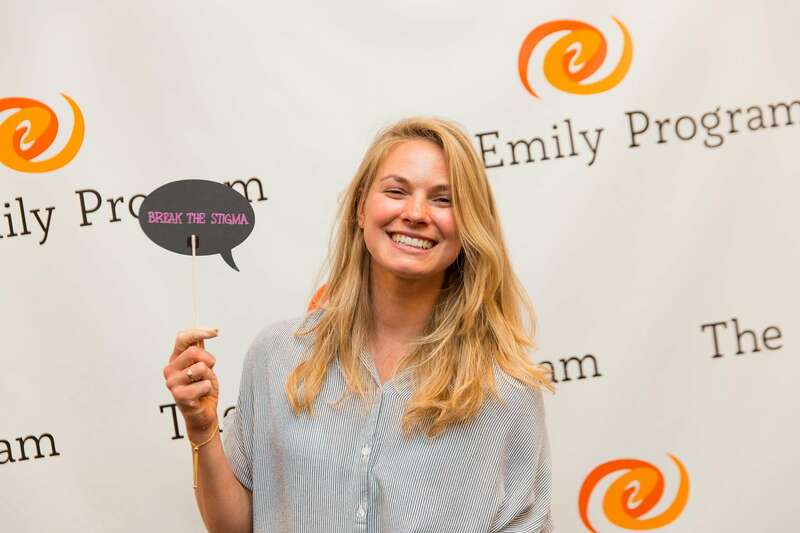 Keynote speaker and Olympic gold medalist Jessie Diggins inspired the audience by recounting her experience with an eating disorder and how The Emily Program saved her life. Jessie spoke about how her eating disorder got out of control following high school and how her parents encouraged her to seek help. Jessie eventually found The Emily Program, where she entered treatment and experienced recovery. Since her eating disorder recovery, Jessie has gone on to become an Olympic champion. While Jessie’s career is something she is incredibly proud of, what matters the most to her is that she can use her voice for good. During her speech, Jessie encouraged those struggling to reach out for help because recovery changed her life for the better. Jessie finished her talk by saying that recovery allowed her freedom and that instead of being worried about how she looks, she is now only concerned about “what her body can do” and the amazing places it can take her. Senator Amy Klobuchar also spoke at the celebration, recounting her experience with Kitty in working to get the 21st Century Cures Act passed. Senator Klobuchar discussed the importance of eating disorder treatment and emphasized The Emily Program’s ability to help individuals of all identities experience lifelong recovery. 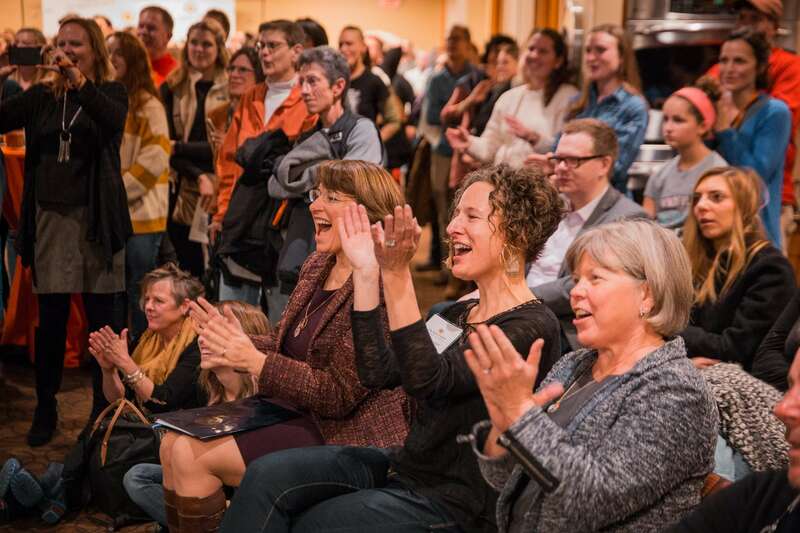 On behalf of The Emily Program family, we want to say thank you to everyone who attended our celebration (as well as those who couldn’t make it but celebrated in spirit!). We truly believe that by openly discussing eating disorders, and the need for treatment, we can break the stigma and help encourage those suffering to reach out for help. As always, if you or someone you love is struggling with disordered eating, we are here to help. Reach out to us at 1-888-364-5977 or complete our online interest form. Olympic gold medalist Jessie Diggins. Senator Amy Klobuchar speaking about the importance of access to eating disorder treatment. 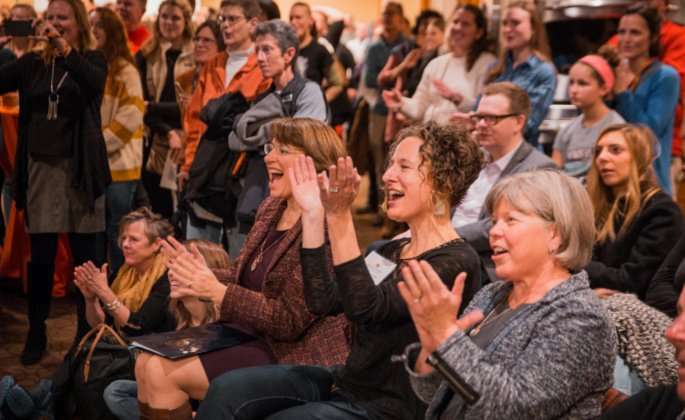 Senator Amy Klobuchar, The Emily Program’s Jillian Lampert, and activist Kitty Westin applaud Jessie Diggins for sharing her recovery story. Staff and community members were happily comforted by therapy dogs. Event-goers pose in one of our photobooths. 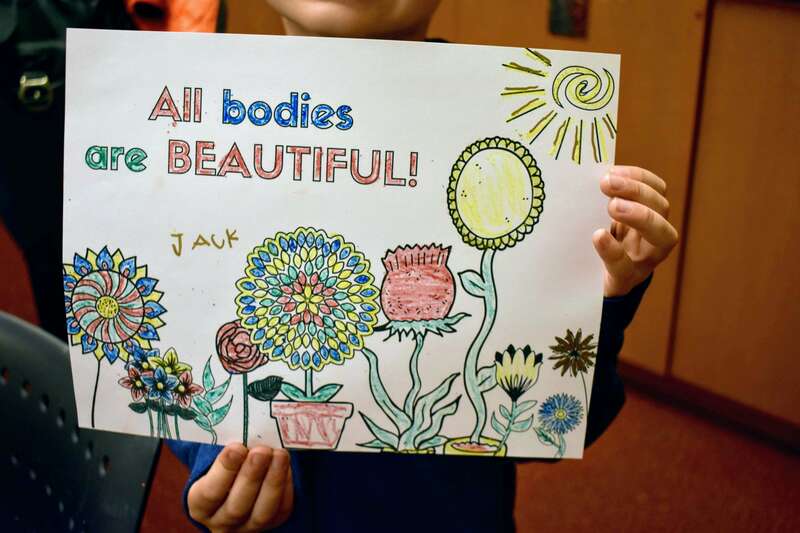 One of the beautiful coloring creations made by Jack! Our “All Foods Fit” station.